Note: To the dismay of many parents, this double stroller has been discontinued. Please have a look at our review of the Zoe XL2 BEST double stroller here. 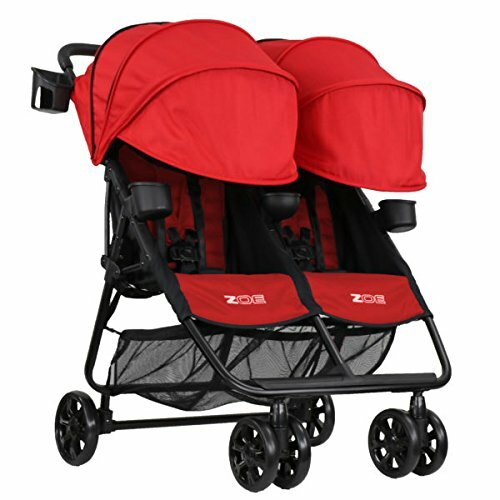 This double stroller is a premium product at a value price, and it is backed by numerous warranties and guarantees for your peace of mind. 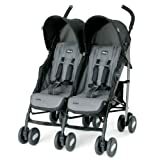 It is very difficult to find a double stroller of this quality with the same features and portability that the Zoe XL2 DELUXE offers, and everything about the design and features points to a careful attention to detail when it comes to potential wants and needs for families with multiple children in a stroller at the same time. 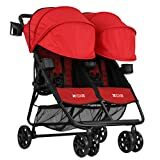 If you are in the market for a high quality double stroller that is perfect for traveling and your daily errand running, get your family a Zoe XL2 DELUXE Double Xtra Lightweight Umbrella Stroller System, and make your many adventures out and about with your kids more about time together than time wrestling a cumbersome, heavy stroller. Shopping for a stroller can be an intimidating process. This is going to be the primary mode of conveyance for your little ones for the first several years of their life. If you have multiple children who are stroller age at the same time, this can significantly add to the difficulty of the selection process. How easy to fold out/fold up is the stroller? Will it accommodate both kids safely, or will one child be too big while the other is just the right size? Is this stroller going to be so heavy that it almost requires a team lift to get it in and out of your vehicle? Is it going to have the right accessories and amenities you want it to have since you will be taking it everywhere for the next several years? All of these are excellent questions, and that is why the Zoe XL2 DELUXE Double Xtra Lightweight Twin Travel & Everyday Umbrella Stroller System is the answer to all of this troubling concerns. 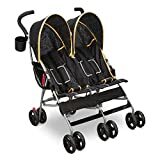 In order to demonstrate why this double-stroller is the best possible stroller for you and your family, let’s take a look at the quality and features this model has to offer. ZOE XL2 DELUXE Double Xtra Lightweight comes in more than 10 colors. The manufacturer is not kidding around when they call this model lightweight. 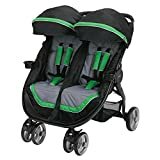 At 16 pounds, this is one of the lightest strollers on the market, as most double strollers you will find for sale usually weigh in at as much as 30 to 40 lbs.! This makes the Zoe XL2 DELUXE ideal for both air travel and public transportation. The secret to keeping this stroller so light lies in its use of an aluminum frame, which is both durable and super light, allowing Zoe to provide a lightweight stroller solution without compromising the durability or integrity of this stroller. The 5-point harnesses on both stroller seats are thickly padded, and the release catch requires 30 lbs. of pressure in order for it to be unlocked. This important safety feature makes it exceptionally difficult for your child to unbuckle themselves. In addition to being extremely easy to carry, this stroller folds and locks with just a quick tug on the seat straps, folding up with minimal effort and locking into a standing position. From removable belly bars to parent and child cup holders, this stroller is exceptionally customizable, and clearly designed to grow with your children as all accessories are detachable and washable. Not only are the wheels guaranteed for life against breakage with free replacement, but the front swivel wheels can also be locked and unlocked for increased mobility over distances or in tight spaces. Best of all, this stroller comes with three different color wheel cap sets to help you make your stroller easily recognizable and its own unique look that reflects your tastes and personal style. The brakes on this stroller can be locked individually on the back wheels, or they can be locked with one step on the large rear brake bar to instantly lock both rear wheels. With oodles of storage space in the twin pockets behind each stroller seat, you will never want for space to put all your gear for a day at the park or your weekly grocery shopping trip. If it won’t fit in the pockets, this model also has a large storage basket underneath the seats for additional convenience. Locking front wheels and convenient rear braking bar. Lifetime Wheel Warranty is non-transferable.